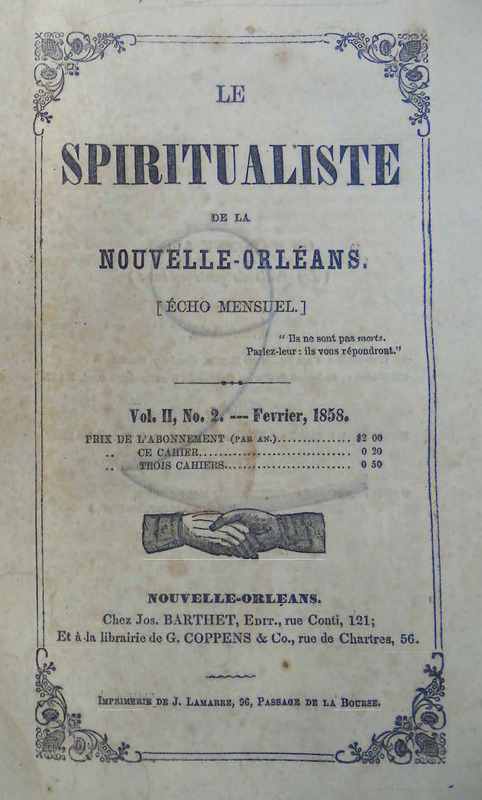 Spiritualiste [de la Nouvelle-Orleans], Le. 1/1, January 1857-December 1858. $2.00 a year, 28 pp. The journal formally added "de la Nouvelle-Orleans" to its title beginning in January 1858. The Spiritual Telegraph for March 21, 1857 says that while Barthet was editor "in the external . . . the publication purports to be mainly under the superintendence of the Spirits." Barthet was an anticlerical engineer, a fugitive from the France of Napoleon III, sent to America by Baron Dupotet, as the Journal du Magnetisme announced in 1856. Buchanan's Journal of Man lists him as a member of the Magnetic Society of New Orleans (1846-1851). (Online: spirithistory.iapsop.com). Sam Riley, "Exotic Americana: The French-language Magazines of Nineteenth Century New Orleans," Journal of Magazine & New Media Research 1/2, Fall 1999 says of Barthet: "A 'medium' who claimed to be able to communicate with the spirit world, Barthet used a method of 'interviewing' that would make today's tabloid writers blush: he would 'contact' famous individuals who long had been dead and write up their 'revelations.' Barthet was also able to coax poetry from his 'Amis Invisibles.' Among these friends were Pope Leo X and Fenelon. The magazine's cover page showed two disembodied hands clasping one another, presumably representing contact between the corporeal and spirit worlds." It is said that Berthet's seances included members of New Orleans' gens de couleur, the city's free-black intellectuals-a notable fact for the period. The same source also says that the journal was suppressed after conflict with the authorities and the Church - a not unlikely consequence of Barthet's regular comments on "Immoralites Orthodoxes" and "Immoralites des Jesuits." Jean-Marc Allard Duplantier, "'Nos Freres d'Outre-Golfe': Spiritualism, Voudou and the Mimetic Literatures of Haiti and Louisiana" (Ph.D. dissertation, LSU). The journal reported on seances in New Orleans with the occasional visiting "American" medium like Rollin M. Squire and with native French-speaking mediums (and spirits), all attended by a slight sprinkling of American visitors, but most of its content was translations from English-language periodicals and newspapers. The Bibliotheque Nationale says the journal was succeeded by Le Progres Spiritualiste of Sceaux in France, which may indicate that Barthet returned to France during the American Civil War. LOC; NY State Library; Yale University; University of Texas, Austin; University of Notre Dame; Louisiana State University; Harvard University; Princeton University; University of Tennessee; University of Texas, Austin; Staatsbibliothek zu Berlin; and other locations in OCLC.